PennsylvAsia: Shibori Peace Quilt Event at Children's Museum, April 18. Shibori Peace Quilt Event at Children's Museum, April 18.
via Remembering Hiroshima, Imagining Peace. 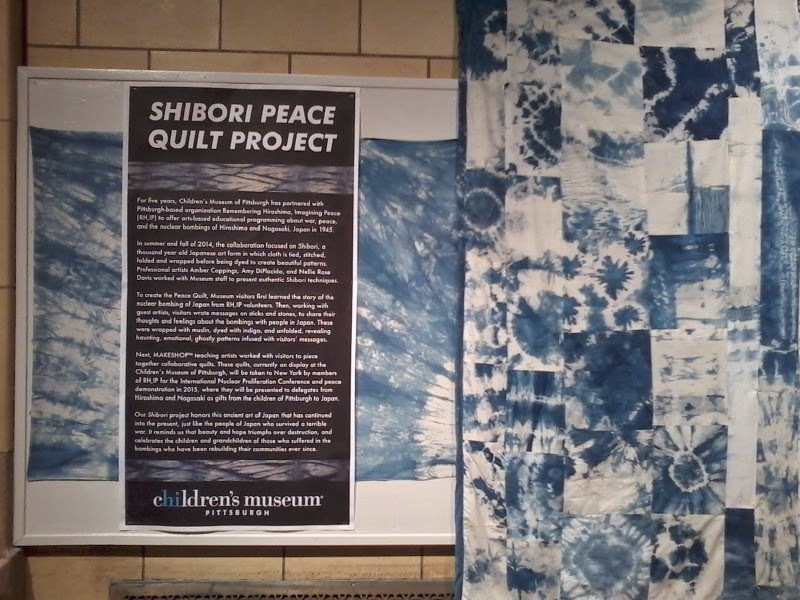 The Children's Museum of Pittsburgh (map) will hold a Shibori Peace Quilt Event on Saturday, April 18. Last fall, visitors created Shibori pieces in the Studio that were sewn together in MAKESHOP to form a quilt. Not just one quilt was made, but four! Shibori is a Japanese word for dying fabric. Shibori is a 1000-year old art form in which cloth is tied, stitched, folded and wrapped in many different ways and then dyed to create beautiful patterns. The quilts were displayed at the Children's Museum; and now, members of the group Remembering Hiroshima, Imagining Peace are ready to take two quilts to New York City for the International Peace & Planet Conference a Nuclear-Free, Peaceful, Just, and Sustainable World, where the quilts will be presented to delegates from Hiroshima and Nagasaki to take back to Japan. The quilts will be received in Japan by New Japan Women's Association and Chihiro Art Museum Azumino. Our Shibori Quilt project reminds us of the beauty that triumphs when cross-cultural understanding and respect is met. The event includes a violin performance and a dove release. It runs from 12:00 to 1:00 pm and is free with museum admission.